A beautiful sunny day quickly turned sour this past weekend (2/25/17) in Lehigh valley as a major thunder squall rolled into the area; resulting in downed trees and major structural damage throughout the greater Lehigh Valley area. The Locust Street Apartments in Macungie PA were among the affected buildings. 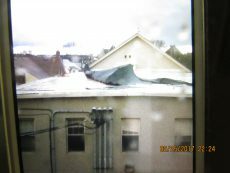 The high winds caught a corner of the flattop roofing and blew away most of the ~4,000 ft2 protective shell, leaving the building underneath exposed to the harsh elements. With the building exposed, the rain intensified its assault on the building. The water from the rain was soaked up by the building like a sponge, destroying the insulation, wiring and carpeting among other. We were contacted to help with the situation. This wasn’t the first time we had been to this property. 21 years ago; when the property was still an old and run-down silk mill, Tom Williams purchased the property for renovation. He and his team had a vision for the building as a modern and space efficient housing complex that tenants would enjoy living in and property owners would like to add to their portfolios. After completing construction, the building was purchased by the Valley Housing Corporation to be used for their senior living project. That is one reason why, as the thunderstorm raged on, the Valley Housing Development Corporation knew just who to call in this kind of situation. We arrived at the property as quickly as we could to help the building in need. 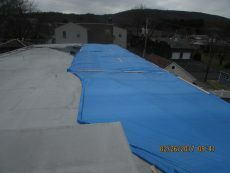 Our first objective was to prevent any further damage to the property by weatherizing the building. Afterwards, we brought our crews into the building to mitigate the water flow and to minimize the interior damage. With the water mitigated we went to work on moving the contents in each of the apartments out of harm’s way—as always we make sure to photograph each room before removing any personal property so that when we complete the restoration of the damages we can put almost everything back were we found it. 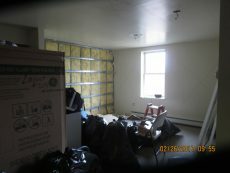 After the contents were cleared, our teams went to work on removing the soaked insulation, drywalls and carpets from each of the apartments. With an attention to detail we made sure that there were no spots left unchecked. Any damp area left untreated is at high risk for mold growth and a potential hazard for health. Our experience always comes in handy here as we are able to identify, treat and remove all damaged areas quickly and professionally. With the property cleared out and Mother Nature actually cooperating with nice weather, we were able to go through and reconstruct the damaged parts of the complex quickly. Our crews made quick work of replacing the drywalls in the building and of removing and replacing the insulation. The electrical contractors did their part with replacing and fixing the electrical work in each of the apartments. With the wall and ceilings restored, the floors were laid in and new carpeting installed. Thanks to the fact we have some strong people on our crews; moving back in all the heavy furniture was like bringing home the groceries. With an eye for precision we placed everything back the way it was pre-storm. From start to finish we had these homes restored in less than 90 days. 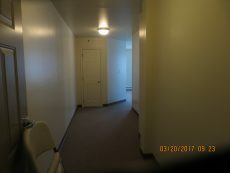 Speed was of the up-most importance in this project, since this is the primary housing for most of the independent senior residents residing in the apartments. It was vital for us to restore the property from damaged to habitable as quickly as physically possible since this was the only housing available for several of the residents other then area hotels. More importantly, this is our standard procedure for all clients we work with. For all of our clients, we want the impact of the damages to their homes and lifestyles to be minimized.